At this moment, I’m preparing for a conference in South Africa, trying to stay on top of my writing, and I have TEN children, all in various stages of life. If I were to have an excuse not to take time to be with Jesus, this would be it. Staying up late every night until midnight, packing during the day and chasing kids around the house, you’d think I’d cherish every extra moment of sleep. Yet my eyes still pop open in the morning. Not because I’m wide awake, but rather because my heart is hungry. I need Jesus. I need to read His Word and spend time with Him. After years of loving Jesus, my heart reveres Him. I stand in awe of what a difference spending time with Him makes in my life. In Jesus’ arithmetic, “subtracting” time from our busy day multiplies the potential of every moment. Because of our time with Him we have a clearer vision, a more peaceful heart and a more joyful spirit. When I spend time with Jesus, I better discern what to spend my time on. My day seems to work better, and in the way Jesus works the hours of the day seem to multiply too. This week is busy, yes, but when I spend time with my Lord I can make it through the day better than I anticipated I could. Faith Step: Find at least two other times during the day to get away with Jesus. Think about times like the ten minutes when your biscuits are baking at dinnertime or the fifteen-minute break you have at work. Afterward, consider how that time focused on Jesus impacted the rest of your day. Read the original post at Guideposts.org. Want more devotions? Check out Mornings with Jesus 2016. This uplifting daily devotional book includes 366 short five-minute readings that help you rest and recharge your spirit by putting your focus on the Living God. Each page begins with a Scripture quote, followed by and uplifting devotion that demonstrates how Jesus’ life and teaching apply today. With humor, humility, and grace, the writers share insights that are easily relatable. A Faith Step is also included for you to practice throughout the day. The Faith Step will inspire and challenge you to apply the day’s message to your life. For those who are seeking a deeper experience in their relationship with Christ, Mornings with Jesus 2016 offers a fresh perspective of who Jesus is and what that means for day-to-day life. As you focus on His truth, you will experience an abundance of blessings that spring from your ever-growing personal relationship with Him. 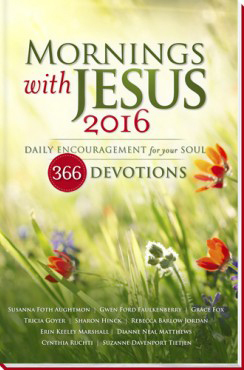 With a warm and friendly voice, 366 short devotional writings on the character and teachings of Jesus encourage you to greet each day by drawing near to Him and inviting His presence into your day. Spend time with Jesus at the beginning of each day and experience His nearness and peace in a new way throughout the year. Hi. When will you be coming to South Africa & where will you be speaking? I live in Johannesburg.